The U.S. Geological Survey is conducting a series of multidisciplinary studies of the San Luis Basin as part of the Geologic Framework of Rio Grande Basins project. Detailed geologic mapping, high-resolution airborne magnetic surveys, gravity surveys, magnetotelluric surveys, and hydrologic and lithologic data are being used to better understand the aquifers in the San Luis Basin. This report describes one north-south and two east-west regional magnetotelluric sounding profiles, acquired in June of 2010 and July and August of 2011, across the San Luis Basin in northern New Mexico. No interpretation of the data is included. 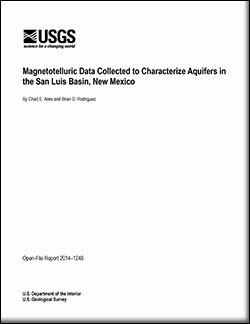 Ailes, C.E., and Rodriguez, B.D., 2015, Magnetotelluric data collected to characterize aquifers in the San Luis Basin, New Mexico: U.S. Geological Survey Open-File Report 2014–1248, 9 p., https://dx.doi.org/10.3133/ofr20141248.